What It’s About: In 17th century Russia, Princess Asa (Barbara Steele) is condemned for vampirism and witchcraft, but before the executioner pounds a spiked mask into her face, she promises revenge from beyond the grave. 200 years later, two doctors (John Richardson and Andrea Checchi) stumble upon the tomb of Asa and unwittingly free her. Will they be able to save Asa’s descendant Katia Vadja (also Barbara Steele), or even themselves? Why Watch it Today? 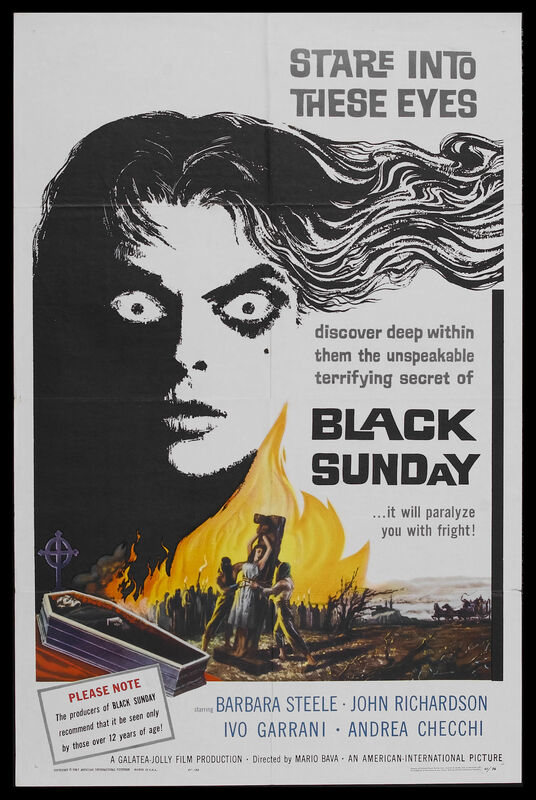 : For some reason U.S. distributors American International Pictures decided to change the title from Mask of Satan to Black Sunday, but on this last Sunday before Halloween, why not watch this wonderfully atmospheric (and quite different from usual) vampire tale from, Italian horror director Mario Bava? This entry was posted in Adaptation, Based on a Short Story(ies), Black and White, Gothic Horror, Horror, Independent, Movie of the Day, Period Film, Vampires and tagged AIP, Barbara Steele, castle, curse, cursed town, Drive-In, dual role, execution, family curse, gore, Italy, Les Baxter, Mario Bava, Nikolai Gogol, priest, prince, princess, Samuel Z. Arkoff, village, warnings from townsfolk. there’s a colorized still from this movie on youtube; hopefully one day this movie will be in color, looking like bava’s BLACK SABBATH. So you think colorization is a good thing? Can’t stand it myself. Leave black and white films alone. I can’t say I’ve read the Gogol story to make the comparison. I could have sworn when I watched the Tim Lucas commentary there was some kernel of the story that made it to the film, but I could be wrong. Long time since I’ve listened to that commentary track.